No, not the orangutans… Us. 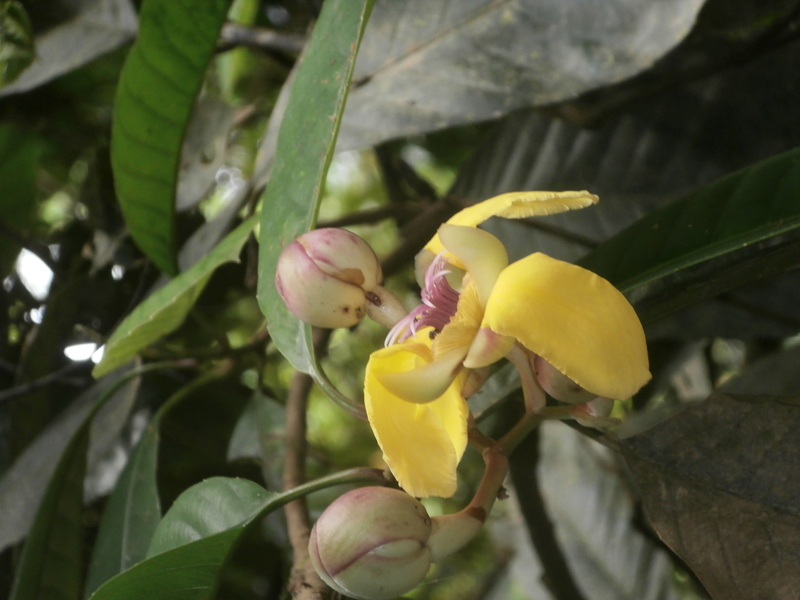 We spent three days and two nights in a jungle camp in Borneo. It was hot and humid and we definitely smelled after three days in the jungle with no shower. 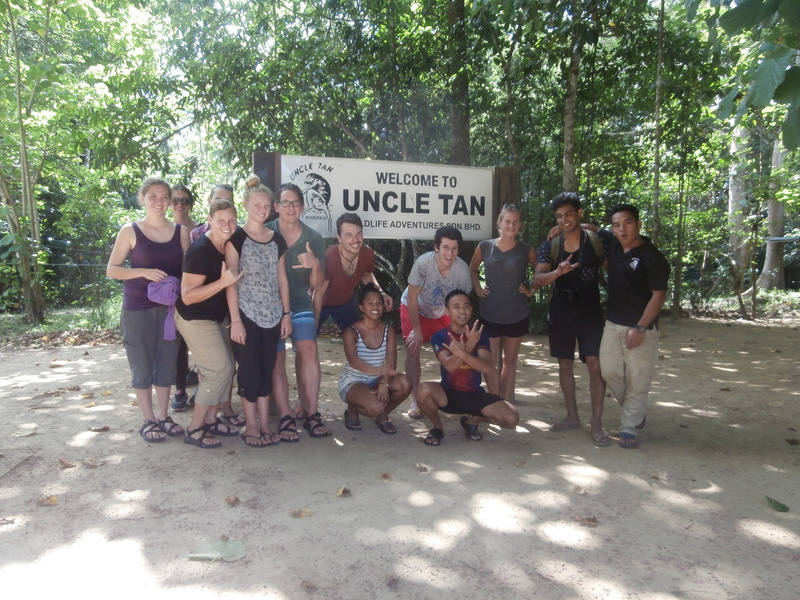 After our fun day at the Sepilock Orangutan Rehabilitation Center, we had a relaxing morning at Uncle Tan’s Bed and Breakfast where they fed us breakfast and lunch. The food was edible, but not great. We also enjoyed the free wifi in the common area. Surprisingly, this jungle cabin had better wifi than most of the places we have stayed so far on this trip. Around 2 pm a van picked us up to take us to the jungle camp. It took about an hour to get to the river. We hopped out of the van near the small wooden dock. Of course, we had to make the obligatory potty stop at the squat toilet outhouse before getting on the boat. 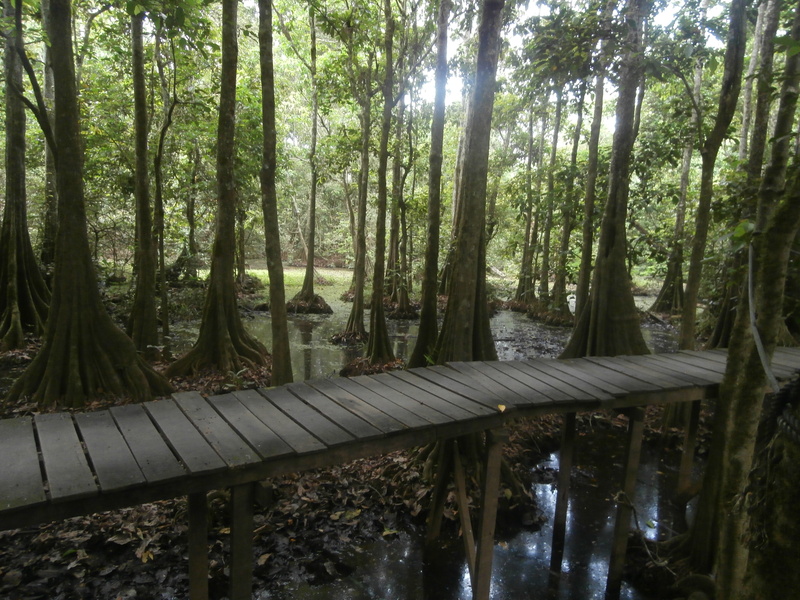 I had to convince Arwen to use the squat toilet by explaining that it would be the only chance she had to use the bathroom for the next hour or so until we made our way down the river to the jungle camp, which would also probably have squat toilets. Then we donned our life jackets and climbed into the canoe–like motor boat. It was a largely uneventful hour long boat ride. Our guide said we would only stop if we saw a really interesting animal along the way, since we would be going on two more boat safaris in the next 2 days. And macaque monkeys did not count as interesting since they were everywhere. After dinner, which consisted of basically the same food we had been eating at the bed and breakfast, we took our first evening boat ride. The guide would shine his flashlight along the shore looking for “reflective eyes”. 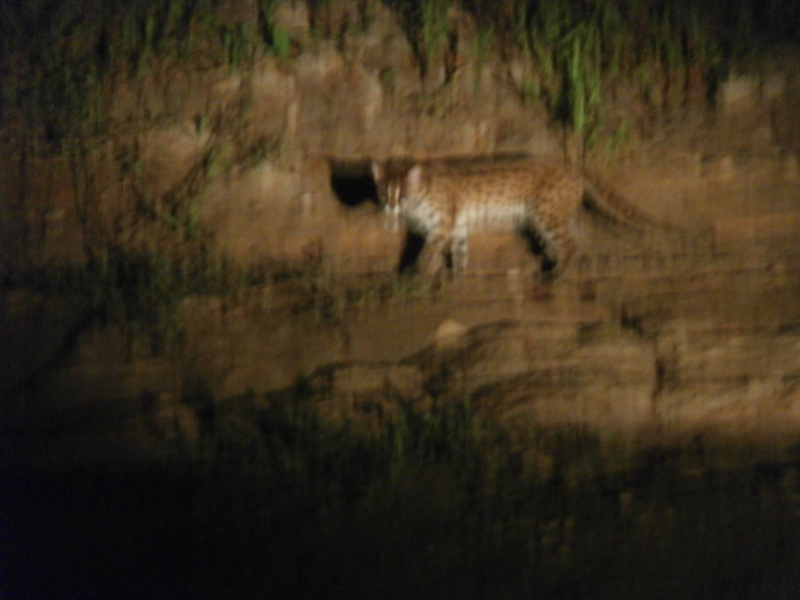 We saw a baby crocodile, a sleeping bird, and a leopard cat. Leopard cat with reflective eyes. Eventually Sierra took a turn with the guitar. She and her sisters sang a couple of their favorite songs in harmony. That may have been Sierra’s favorite part of the jungle camp since she has been missing her guitar. After a sweaty night’s sleep under the mosquito net, we got up at 6am for the morning safari. I have to admit that I slept through most of it. Even sitting on the hard canoe bench with an aching back, the hum of the motor and the rocking boat kept lulling me to sleep. I could barely keep my eyes open. Following breakfast, we took a jungle “trek”. We rode in a boat to the hiking trail. The trail was dry, but we got our tennis shoes totally muddy getting on and off the boat. In fact, our muddy shoes are still in plastic bags in our packs since we have not yet figured out how to clean them. We saw some bugs and cool plants and trees. It was too hot for any animals to be active. Including us, really. When we got back to camp, we took a cue from the animals and tried to rest. It was so humid that everything in our hut was damp, especially us. 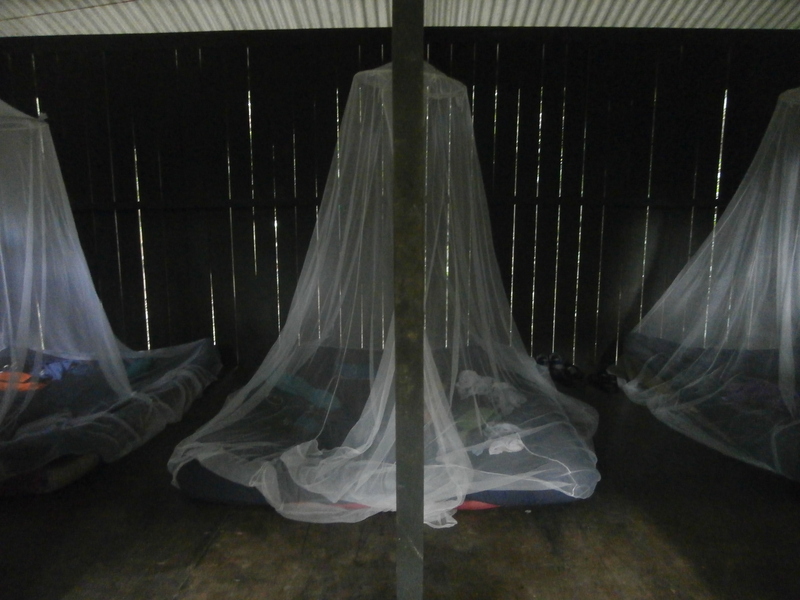 So we laid on the mats under the mosquito nets, in a pool of our own sweat, and tried to nap. At this point we all really needed to bathe. Our choices were getting in the river or dumpig buckets of water on our heads. The river wasn’t recommended because of the crocodiles. The twenty-something guys in our group chose this option. We did not. The only water available to dump on our heads was river water collected in large blue tubs that was also used to flush the toilets. We chose to remain dirty. 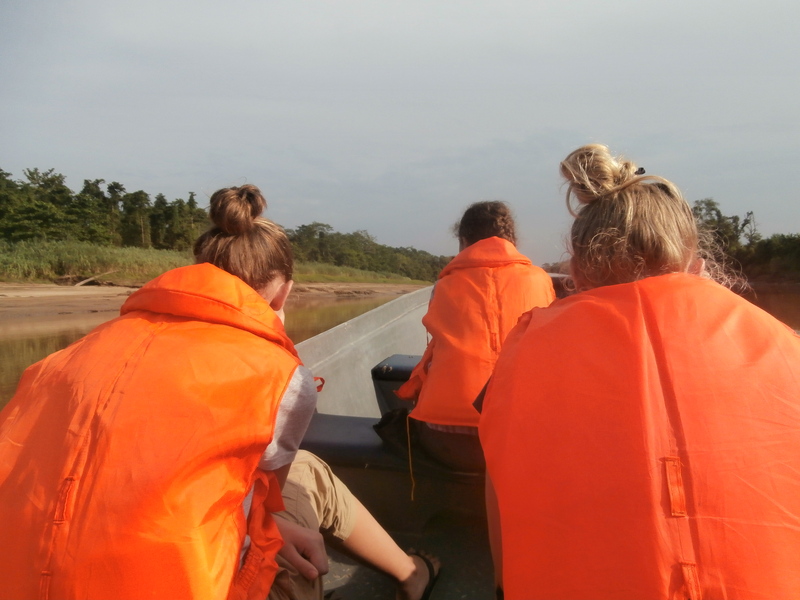 The second evening boat ride focused on finding proboscis monkeys, gibbons, and orangutans. Our guide would scan the trees for movement. 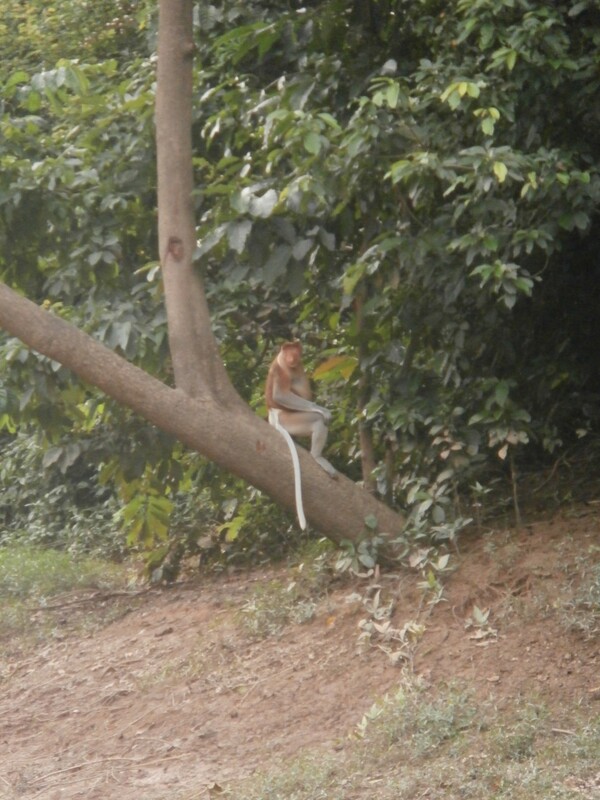 We spotted a couple groups of proboscis monkeys and saw a few gibbons, but they were hard to see without binoculars. We didn’t see any orangutans, but that was all right since we had seen a bunch in Sepilock. During this ride, we finally got to stop and watch the macaque monkeys. They really were everywhere along the shoreline. The guide called them the “jungle mafia.” He also pointed out every time the male monkeys would approach the female monkeys for “business.” And it was a lot. “Business always business,” said the guide, as he would count the 3 – 5 seconds that the transaction would last. 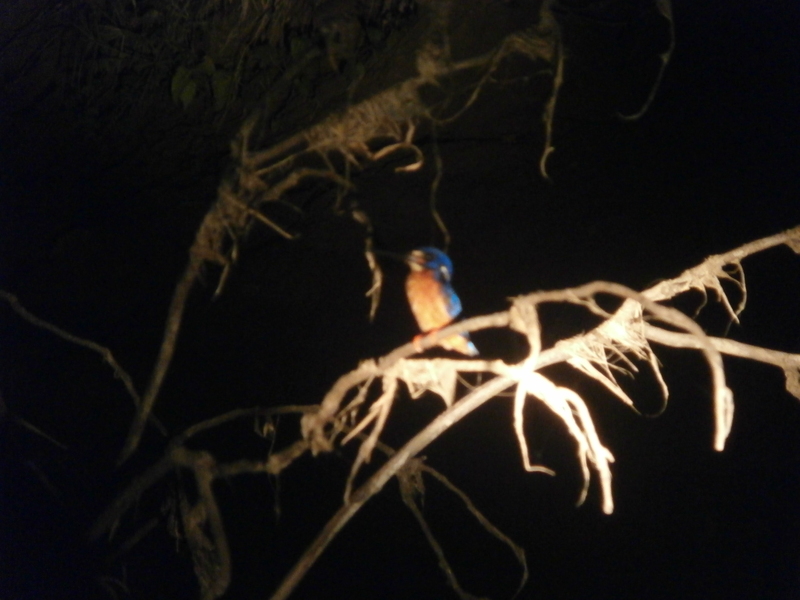 That night we went on a night safari. We walked through the jungle with our guide, shining our flashlights around, looking for reflective eyes. 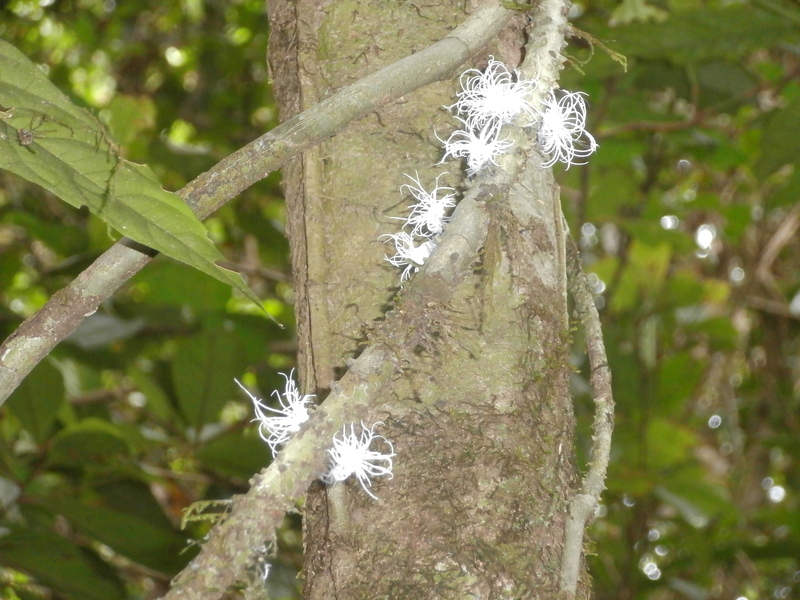 We found out that there are a surprising amount of spiders in the jungle by the large number of tiny reflective eyes we saw. We also saw a couple of sleeping birds, which are cool because they don’t fly away when you take their picture. Sleeping bird. Even the camera flash doesn’t wake it. 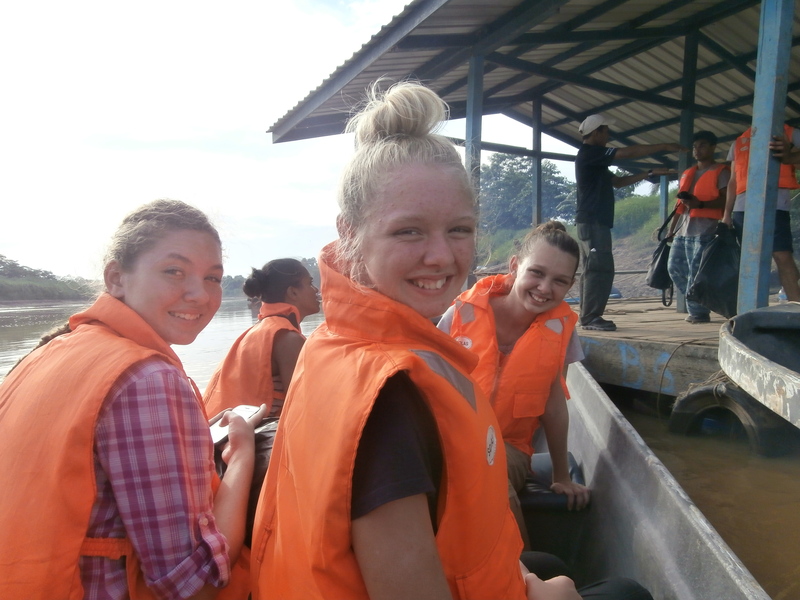 We all agreed that the boat rides were more fun than the jungle walks, and not just because it was easier and cooler to sit in the canoe than to walk in the humid jungle. The animals on the shore were more interesting, too. Walkway to the bathroom. Cool setting, but also why I didn’t want to walk to the bathroom in the middle of the night. The final morning we packed up to leave and discovered that the money in the girls’ money belt (we call them “smellies” because, well, after sweating in them everyday, they smell) had been stolen. When we first got to our huts, we all wanted to take our money belts off because we were so sweaty. We usually only wear them on travel days. Rand and I had a bunch of cash because we knew it would be hard to find an atm in the area we were staying in Borneo. I put my cash in a hidden velcro pocket in my pants that my mom had sewn for me, and Rand put his in his zipper pants pocket. The girls just had their emergency cash (about $25 each), so they left theirs in their smellies. We didn’t figure they would have any need for cash in the jungle camp, so I told them to bury their smellies in their backpacks. I guess all those boat rides and jungle walks gave someone plenty of time to rifle through our bags. Boo! We should have been more careful. Rand said this actually happens a lot, but he hadn’t read about it happening at this jungle camp. Rand approached the staff about it, but they all said the same thing, “This never happen before.” Oh well, lesson learned. Us, some twenty somethings, and our jungle guides who may or may not have stolen our money. After an hour in a boat and an hour in a van, we arrived back at Uncle Tan’s guesthouse. We enjoyed some internet and choked down some lunch while waiting to take a taxi to the airport. The food wasn’t terrible, but it wasn’t good, and after eating basically the same thing for 10 meals in a row, we were all pretty sick of it. We felt pretty bad getting on an airport in our three-days-in-the-jungle-unshowered state. But it turned out we weren’t the smelliest things on the plane. Someone brought a package of the fish that smelled worse than us. A couple wafting fish-smell hours later, we were in Kuala Lumpur with somewhat fresher air and showers! The cotton spiders and the sleeping birds were worth the trip. This is interesting because I can sit here in my air conditioned home and enjoy your adventures.